SIP ALG (Application Layer Gateway) is a mechanism found in most routers that rewrites packets transmitted across the device. Certain protocols are processed by the application layer gateway (ALG) and rewritten to allow better flow through a firewall or when NAT (Network Address Translation) is employed. The SIP protocol is one of several protocols managed by this system. One of the most common issues with VoIP solutions relates to audio transmission and presence of a firewall and/or NAT traversal being configured. In many cases, a properly configured system may still have audio issues when transmitting or receiving calls where only one party is heard during a call. Implementing the necessary changes to disable SIP ALG can oftentimes resolve these issues. What is SIP ALG and Why is it Bad? The problem with SIP ALG is the fact that most times, packet rewriting causes undesirable operation. The intent of the technology was to assist the packet flow of SIP and other packets and help solve NAT related problems. In this case, the ALG's function is to perform a stateful packet level inspection (SPI) of traffic coming through it. SIP messages would then be re-written by SIP ALG to allow the correct communication of signaling and voice traffic between endpoints and effective NAT traversal. The frequent result in lower end routers is however a hindrance for data transmission due to poor implementations of ALG that break SIP. Most commonly, the issues many experience relate to one-way or no audio, depending on who initiates the call. In most cases, it is recommended that SIP ALG, SPI and SIP transformations are disabled. With most setups, it is best to disable this feature as this service usually does more harm than good. The following section will help to assist most with disabling this feature on their router. The first few sections will cover the basis of disabling SIP ALG and SPI for higher-class enterprise devices while the lower sections relate to common devices used in small offices or homes. If it worked, the next line displayed after the "do show" command will read "no ip nat service sip tcp port 5060" and "no ip nat service sip udp port 5060". After this message appears, press [CNTRL] + [z] to end the configuration session. Notice in my session, I already had this setting configured for TCP so the only line appearing references UDP. In general though Cisco routers have a high quality SIP ALG implementation that should work well and not cause any issues. Unless you maintain the network at your business, you probably will not have access to the ASA. Making changes to this device is not recommended unless you know what you are doing. Access the console and enable elevated privileges. Enter the following commands to turn of SIP inspection at a global level. For most Cisco ASA models, this will effectively disable SIP inspection for the entire system. If keen to learn and experiment with Cisco solutions, I suggest using the emulator furnished by GNS3. However, such configuration techniques are far beyond the scope of this article. The ASDM client for Cisco devices provides a visual interface for ASA systems, both virtual and physical. If the ASA at your business is manageable by this client, the following techniques should prove to be an easier way for accomplishing the same task compared to the command line techniques described in the previous section. Navigate to the interface while on the same LAN by typing the IP address of the machine in a browser window. If the ADSM client resides on your machine and the system is ADSM capable, a prompt should appear that requests permission to launch the application. Find something resembling a "policy rule" area. Select an item where inspection_ precedes the object/item definition and edit the policy (usually by right-clicking though some interfaces will require selecting the item with a left-click and selecting the Edit item from the bar above). A tab in the next menu should read something similar to Rules Actions. Find a tab or item where the work protocol is used and inspect the items in this list. Locate the SIP item and uncheck the item. Save the settings after completion. Note that this will apply a global setting to your entire device. For port specific settings, navigate to the settings for each port and alter if necessary. Like Cisco, slightly different interfaces are common, relative to the version and model of the system. Generally speaking, these devices are fairly simple to configure with administrative privileges handy. While on the LAN where the device resides, type in the IP address or host name (if DNS is configured) to access the configuration area. From the main menu, find the "VoIP" option that usually appears on the left menu. While in the menu, uncheck the box for SIP - it often appears as "SIP Transformations" and then select the option to "Enable Consistent NAT". Accept the settings and reboot if prompted. 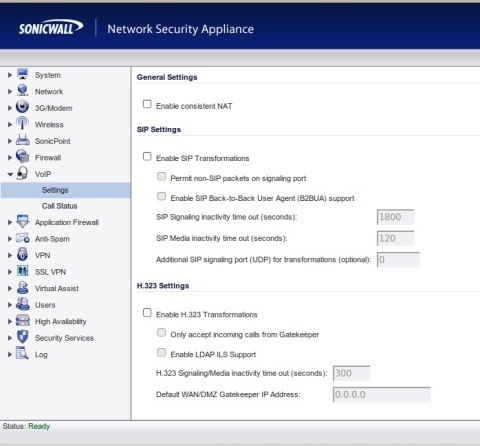 Figure 2 shows an example of the SonicWall user interface on the page where these settings exist. Understand that although this method seems quite generalized, it is the basis for disabling SIP intervention on most SonicWall systems. Netgear has several different interfaces. As this brand is one of the most popular for home and small business networking, variation in interfaces is common due to the large number of devices made by the company. However, the following example should provide a good reference for the more common models and show you how to disable SIP ALG on your Netgear router. While connected to the LAN, open a browser and enter the router's IP address. Enter the authentication credentials - defaults are usually ‘admin’ for the username and "password" for the password. 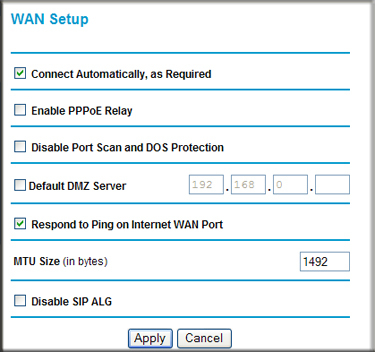 Find the WAN setup option and locate the item where SIP is mentioned (usually, this falls under the Advanced tab). Most models have a check-box reading something similar to "Disable SIP ALG" in figure 3 below. Check the box, apply the settings and reboot if prompted. Like Netgear, D-Link has a variety of different interfaces but the methodology for disabling this setting is very similar for most models. Many models are equipped with a powerful set of firewall tools so several steps must be completed to ensure SIP traffic passes beyond the device. Open a browser and enter the router's IP address in the address bar. Go to "Firewall Settings" under the "Advanced" item. Uncheck the box to disable SPI - usually, directly below this item are options for "NAT Endpoint Filtering" that must be changed to "Endpoint Independent" for both TCP and UDP. 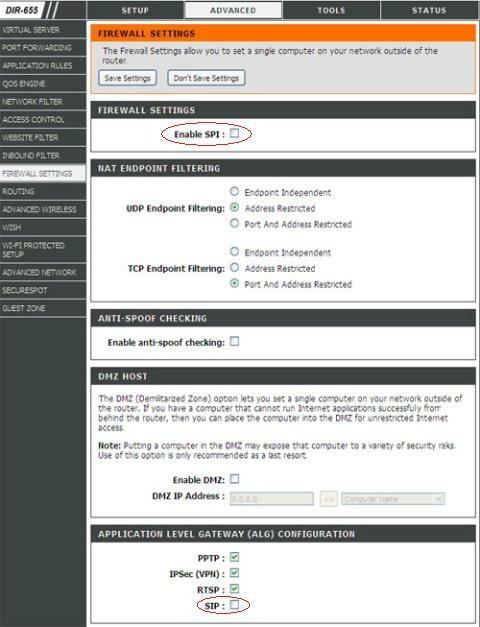 Next, find the "Application Level Gateway (ALG) Configuration" area and uncheck the box for SIP. At the time this article was written, most AT&T services - whether DSL or UVERSE - are packaged with a 2WIRE device. Fortunately, the company allows disabling the service with minimal headache for most models and services. Yet, some models do not have this feature making this process cumbersome. Type in the device IP address of http://192.168.1.254 in any browser address bar. Default username is "admin" and the password can be found on the bottom on the 2wire device. Go to the "Firewall" menu and then select the option for "Applications, Pinholes and DMZ". Select your phone adapter from the the list of IP addresses and then the radio button to "Allow all applications (DMZplus mode)". Save the settings and you have now put your adapter in the DMZ plus zone. SIP ALG now needs to be disabled via the ‘Management and Diagnostic Console’ that can be accessed by entering http://192.168.1.254/mdc (note that not all models of 2wire modems can access this menu and edit the settings). If you can access this console, click on the "Configure Services" found under the "Advanced" heading. Some have stated that it is not possible to turn off this setting. 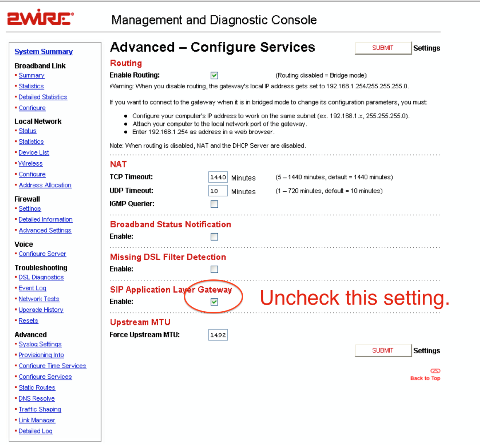 Newer firmware deployments on current models (as of April 2015, when this article was originally written) may not allow disabling this option. Contacting customer service to remote into your device will be the only way to turn off this setting. At the time this article was written (April 2015), there is no possible way to disable SIP ALG on a Comcast router by yourself. Worse yet, the company will not disable this feature for most customers. Buying the Comcast / Xfinity phone service. Hope your service transposes appropriately with SIP ALG. Connect another router to you gateway and put it in bridge mode. Purchase your own gateway compatible with Comcast/Xfinity. The company locks down the devices such that the only voice service allowed is Comcast/Xfinity. The recommended solution involves purchasing a compatible modem for the service where greater control is possible. At this point, contact your VoIP vendor - many have unique firmware settings to push to the device as well as instructions for applying settings for a functional service. Most agree that SIP ALG is the ultimate bane for VoIP services. Sadly, this technology that is supposed to help such transmissions proves to be a hindrance for virtually every product and service in existence. Though many companies have a workaround, some lack a solid solution. We are very interested in hearing your unique problems and resolutions involving this mechanism and if you would like us to investigate other routers. Please, take a moment to comment or ask a question - we would like to help as many VoIP consumers as possible! I have a DPC 3939B router and need to turn off SIP ALG. Do I need to get Comcast involved? -> Response: Depending on the version of firmware you may not be able to disable SIP ALG on the DPC3939. I would call Comcast about this. How about checkpoint 640 firewall? -> Response: Should be a way to do this. See instructions for fields SIP Protocol Handler and RFC Non-compliant Messages.